HOME / Door County Newswire / The $1,000 Search Starts February 4 at The Lodge at Leathem Smith! The $1,000 Search Starts February 4 at The Lodge at Leathem Smith! 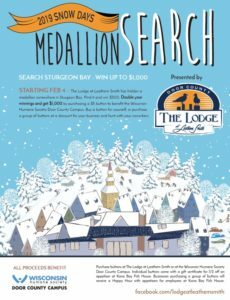 The Lodge at Leathem Smith has hidden a medallion worth up to $1,000 in Sturgeon Bay, WI. 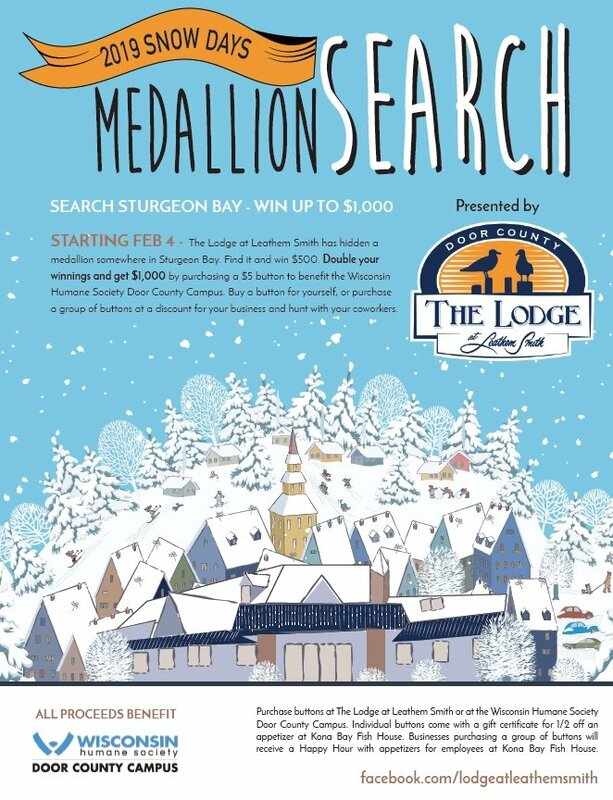 The Lodge at Leathem Smith’s Snow Days Medallion Search starts on February 4, 2019. All proceeds will be benefiting the Wisconsin Humane Society Door County Campus. Participants can find a new clue on display as early as 4 p.m. sharp, every day, at Kona Bay Fish House located in The Lodge at Leathem Smith. The new clues will also be posted on The Lodge at Leathem Smith’s Facebook page later the same evening. Everyone is welcome to play and keep track of the clues for a chance to find the medallion and win $500. 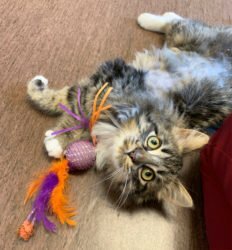 Participants can double the possible prize by purchasing a button for $5 from the Lodge at Leathem Smith for which the proceeds benefit Wisconsin Humane Society Door County Campus. ● Don’t get a button, find the medallion, win $500 cash prize. Businesses also have a chance to participate in the search with bulk button purchases for their employees. Each business or corporation that participates in the Snow Days Medallion Search will receive a one-hour Happy Hour party at Kona Bay Fish House with free appetizers for their medallion hunting employees on the day of their choosing. If a business-sponsored employee button finds the medallion, $500 will go to the employee who found the medallion and $500 will be given to the employer or department with the intentions to be given back to all of the employees. Business or Corporation packages are as follows: $350 for 50 buttons, $200 for 25 buttons, and $75 for 10 buttons. Snow Days Medallion Search buttons will be sold starting February 4 until February 8, 2019. They can be purchased at The Lodge at Leathem Smith and the Wisconsin Humane Society Door County Campus during normal business hours. All proceeds from the Snow Days Medallion Search will be given to the Wisconsin Humane Society Door County Campus. Have some fun with your family, friends, or coworkers while helping find forever homes for Door County pets. For more information please contact Paul Meleen, Owner of The Lodge at Leathem Smith, at paul@thelodgeatls.com or by giving him a call at (920) 743-5555.